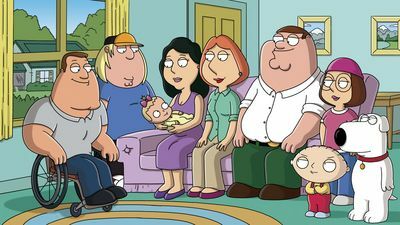 Here's where to watch every episode of Family Guy season 7. Mouseover or tap an episode to see where to stream it. Click or tap the play icon to stream it on the best available service. Love Blactually Sep 29, 2008 Dissatisfied with his current love life, Brian decides to slow things down when he meets the girl of his dreams, Carolyn. However, Cleveland soon sweeps Carolyn off her feet, and Brian must do anything he can do, to win her back, even if it means involving Cleveland's ex-wife, Loretta. I Dream of Jesus Oct 6, 2008 When Peter re-discovers his love for the painfully annoying yet seductively catchy tune "Surfin' Bird," Brian and Stewie decide to take matters into their own hands to ensure that the song will never be heard again! 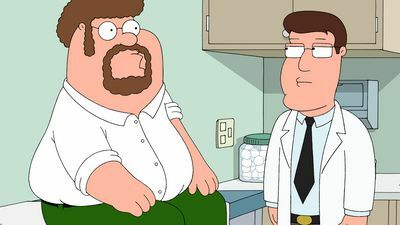 On the verge of tears, Peter goes to every record store in Quahog to track down his beloved jingle, and he runs into a familiar face and ends up hanging out with Jesus Christ. Road to Germany Oct 20, 2008 Mort Goldman accidentally steps into Stewie's time machine and goes back in time to 1939 Poland, and Brian and Stewie follow to retrieve him. 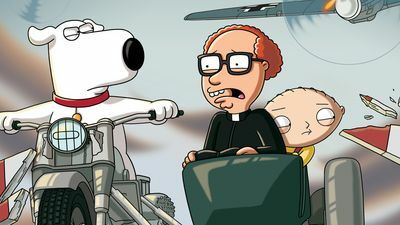 When they find him, the Nazis invade and Mort is taken to Germany, where Stewie and Brian must go to save him, as well as find a way back to the present. Baby Not On Board Nov 3, 2008 Peter gets a lasting supply of gasoline for the year, so the family decides to use it to take a road trip to the Grand Canyon. They pack up and hit the road, but it takes them a while to realize that they had forgotten to bring Stewie with them; when they do, they must make their way home posthaste. The Man with Two Brians Nov 10, 2008 Eight-year-old Brian (who is 56 in dog years) seems to have lost a step or two, so Peter gets a new talking dog, New Brian, to "take some of the load off" the old one, who doesn't like the idea at all. Tales of a Third Grade Nothing Nov 17, 2008 Peter's boss Angela sends him back to the third grade so that he can qualify for a work promotion. Meanwhile, Brian, Frank Sinatra Jr. and Stewie open the coolest club in Quahog. Ocean's Three and a Half Feb 16, 2009 After being pregnant for seven years, Bonnie finally gives birth to a beautiful baby girl named Susie! Stewie quickly falls for the little tyke and vows to do anything to win her heart and get in her diaper. Meanwhile, Joe borrows $20,000 from a bookie to pay for Bonnie's medical bills, but then plans to steal the money from Mr. Pewterschmidt to pay his debt. Family Gay Mar 9, 2009 To help pay off his incredible debt, Peter participates in medical experiments to make some extra cash. First, he is injected with the "Seth Rogen" gene that "gives you the appearance of being funny even though you haven't actually done anything funny." Then he is injected with a gene that leads him to a new mate, leaving a broken-hearted Lois behind. Although the family is crushed, they quickly realize the most important thing is that Peter is happy. The Juice Is Loose! Mar 16, 2009 Peter finds an old winning raffle ticket from 1989 that entitles him a golf outing with O.J. Simpson. After befriending him, Peter brings O.J. home home to meet the family. However, the people of Quahog aren't too fond of the former running back. FOX-y Lady Mar 23, 2009 Lois gets a job working for FOX News and has to do a report on a liberal filmmaker. However, she loses the job when her story implicates a conservative radio host. Not All Dogs Go to Heaven Mar 30, 2009 Meg becomes extremely religious, and tries to convert Brian from Atheism. Meanwhile, after the family visits a Star Trek convention, Stewie kidnaps the entire cast of Star Trek: The Next Generation and forces them to hang out with him. 420 Apr 20, 2009 Brian and Stewie attempt to rally Quahog to try and legalize marijuana. 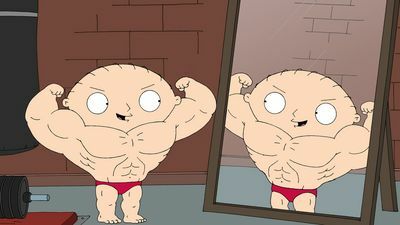 Stew-Roids Apr 27, 2009 Stewie starts going to the gym with Peter after he gets beaten up by Joe's baby daughter Susie, but just when it seems that his hard work is paying off, Peter reveals that he's been giving him anabolic steroid. Meanwhile, Chris begins dating a popular girl at school, only to see her popularity subside. We Love You, Conrad May 4, 2009 When Brian discovers that his beloved Jillian is getting married, he hits the sauce to drown his sorrows. The next morning, he wakes up with more than a hangover. After realizing he has hooked up with "The Hills" star Lauren Conrad, he wants to run and hide. When Brian discovers Lauren is nothing like how she's portrayed on TV, he thinks he may have found his perfect match – if only he can let Jillian go. Three Kings May 11, 2009 Peter learns from a psychic through a palm reading that he had a fascinating past life in the 17th century as Griffin Peterson, a dignified English gentleman who vied for the love of Lady Redbush in the newly founded American colony of Quahog. Peter's Progress May 18, 2009 Peter imagines his friends and family in three of Stephen King's most famous works. 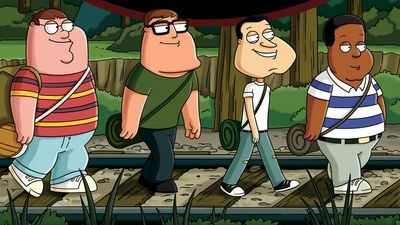 Stand by Me parody - Twelve-year old Peter, Quagmire, Cleveland and Joe travel along a railroad track on a journey of self-discovery. Misery parody - Brian is injured in a bad car crash only to be "rescued" by his "number one fan," Stewie. The Shawshank Redemption parody - Cleveland and Peter become fast friends in prison.